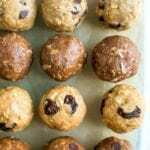 The easiest no bake protein balls on the internet with four different flavors – chocolate peanut butter, tahini chocolate chip, cinnamon raisin and almond joy. Take 10 minutes to whip up a batch of these protein balls and snack healthy all week long! Place oats, peanut butter, honey, protein powder and chocolate chips in a large bowl and stir to combine. Place oats, almond butter, honey, protein powder and shredded coconut in a large bowl and stir to combine.